[prMac.com] Langenhahn, Germany - Norbert M. Doerner has released NeoFinder 6.5 (formerly known as CDFinder). The new version is faster, catalogs more media formats, natively supports App Nap in Mavericks, catalogs thumbnails for RED video files, and much more. NeoFinder makes it easier than ever to keep track of your digital files, photos, songs, movies, fonts on hard disks, USB sticks, server disks, Blu-ray disks, DVD-ROMs, CDROMs, and any other digital media. NeoFinder generates thumbnails and reads a lot of metadata during cataloging, for powerful search possibilities, smart folders, and more. * The AutoUpdater now allows each catalog to be added more than once, so you can now update a catalog multiple times a day, if you want to! Metadata - NeoFinder catalogs metadata of songs, movies, fonts, and photos, including the MP3-Tags of several audio file formats, EXIF, GPS, and IPTC data of photos, and also Adobe XMP. All these are clearly arranged in the user interface, and can be extensively searched. 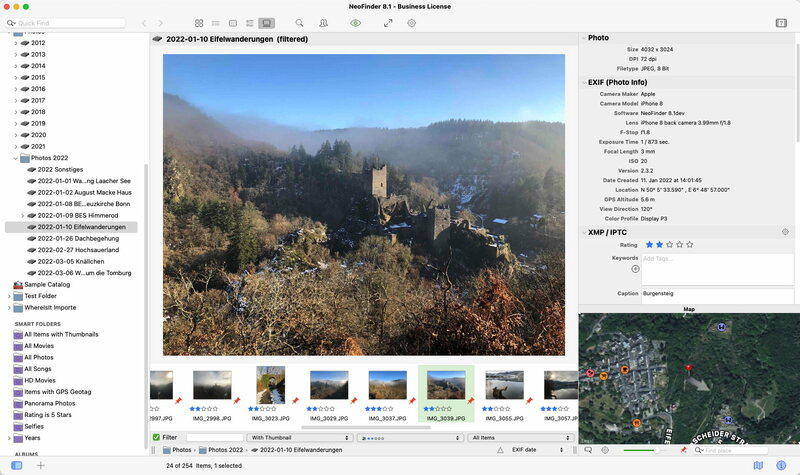 For numerous photo and video formats, NeoFinder generates thumbnails during cataloging, displaying them in all list and icon views. Geotagging - Only NeoFinder offers the integrated GeoFinder, which searches for photos taken near a spot, or the KMZ export for coordinates and photo thumbnails as a way to give geolocated photos to friends. NeoFinder can even geotag photos itself, no other software needed. And only NeoFinder displays amazing facts about any geolocation in the Wikipedia Inspector. Since the initial release of CDFinder 1.0 in 1995, more than 59,000 customers in 95 countries around the world are using CDFinder and now NeoFinder to organise their digital library, and manage their data archive and backups, including NASA, IKEA, BBC, Mattel, Rand McNally, Pfizer, Random House, Oracle, and Warner Bros.
NeoFinder 6 is a paid update to licensed users of CDFinder, update price starting at 19 Euros. Cross-grades for users of competing applications (DiskLibrary, FileFinder, CatFinder, Canto Cumulus, Disk Tracker, DiskCatalogMaker, Atomic View, iView Media Pro, and more) are available. A free NeoFinder demo version can be downloaded from the NeoFinder website, the price for new users starts at 29,00 (EUR). Multiple user packs are available for network users. NeoFinder 6.5 is a free update to all NeoFinder customers. Norbert M. Doerner is a computer scientist with a love for integration and cool products. He develops great Macintosh software since 1991. Popular products include the disk cataloger NeoFinder (was CDFinder), various plugins for the Finder, iPhoto and Aperture, and the transcription software F5.app. Copyright (C) 1991-2014 Norbert M. Doerner. Apple, the Apple logo, Mac and Macintosh are registered trademarks of Apple Inc. in the U.S. and/or other countries. Other trademarks and registered trademarks may be the property of their respective owners.